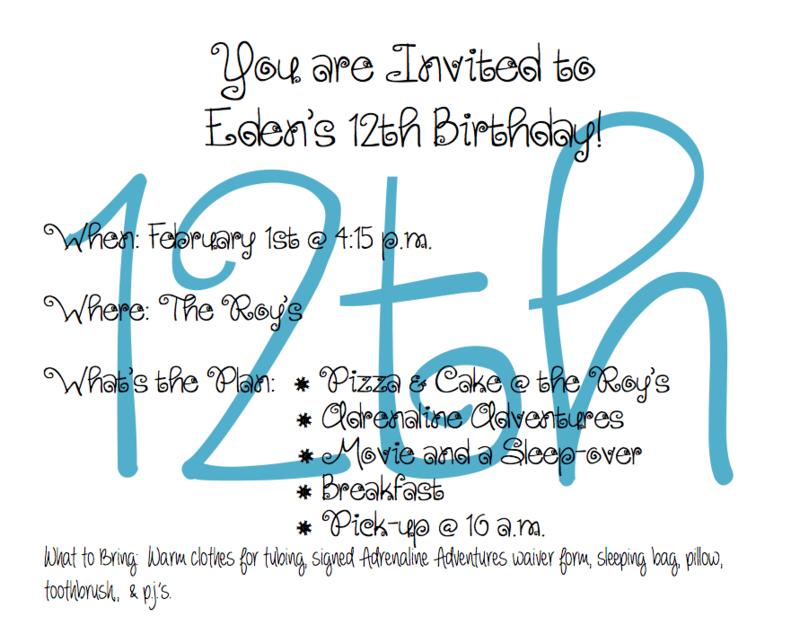 Eden’s 12th birthday is in just a few weeks and I haven’t even got the invitations out! I set aside today to get the job done. I really didn’t have a plan, but thought I would do a winter/snowflake invitation because she wants to go sledding. She is only inviting 4 girls, so the job isn’t as overwhelming as some years. I had lots of paper on hand and decided to have her pick colours from what I had. I picked up this package at Target for $1.30 on Christmas clearance. It is wintry, but not really very festive. Eden loved the colours and picked out the paper she wanted and then I just created the invitation by using the paper she picked as my starting point. 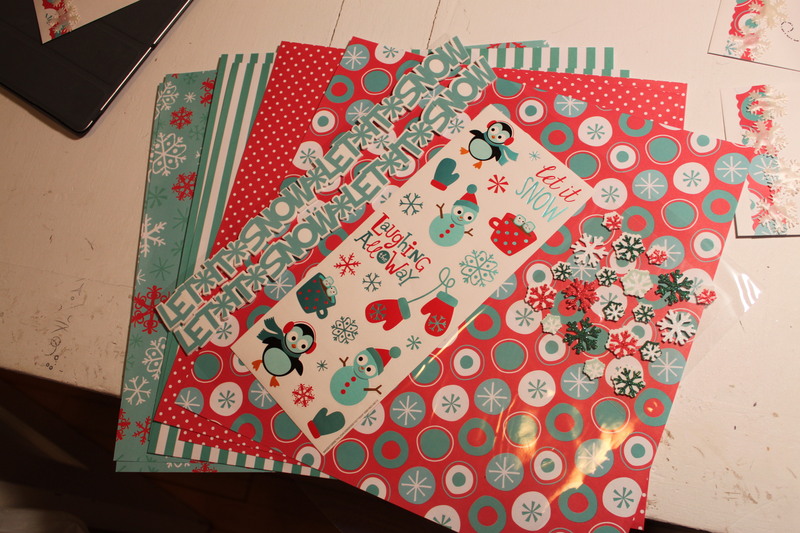 This package contained 8 sheets of 12″ X 12″ paper, a sheet of stickers and a foam “Let it Snow” border. Not bad for under $2. 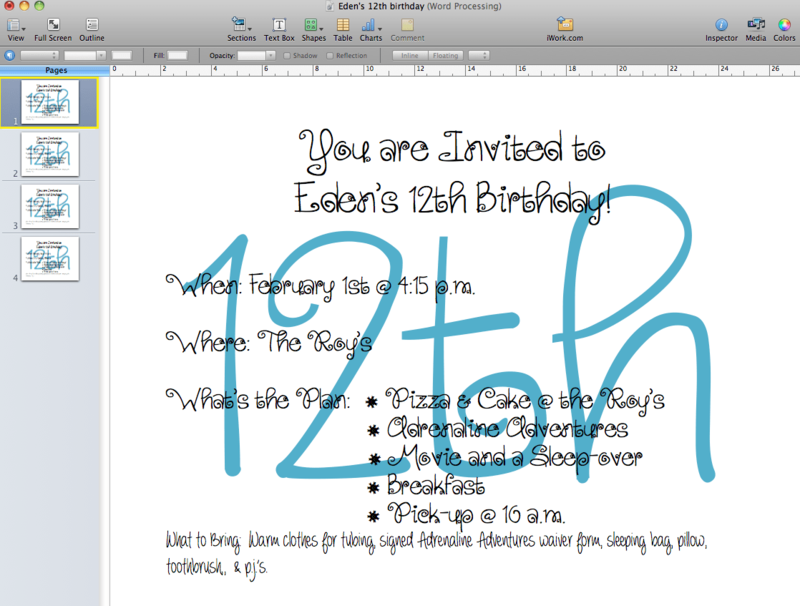 I began by making the actual invitation on the computer. I downloaded a free font called Gingersnaps from www.dafont.com. I love this site and often search for specialized fonts for my projects. I changed the address for the screen shot, but otherwise this is what it looks like. I added a text box in the background, printed her age and then changed the opacity of the teal to 70%. I created the invitation as a full-page document. I then displayed the “page thumbnails” of the page I had created and duplicated the page 3 times, so that I had a total of 4 copies of the invitation. When I went to print the document, I found “Layout” in the drop down menu on the printing page. I then select “4” under pages per sheet. It takes all four of my pages and scales them all down to fit perfectly on one page of card stock. I then cut the page into 1/4’s and proceed to make my invitations, postcard style, by decorating the opposite side of the card. 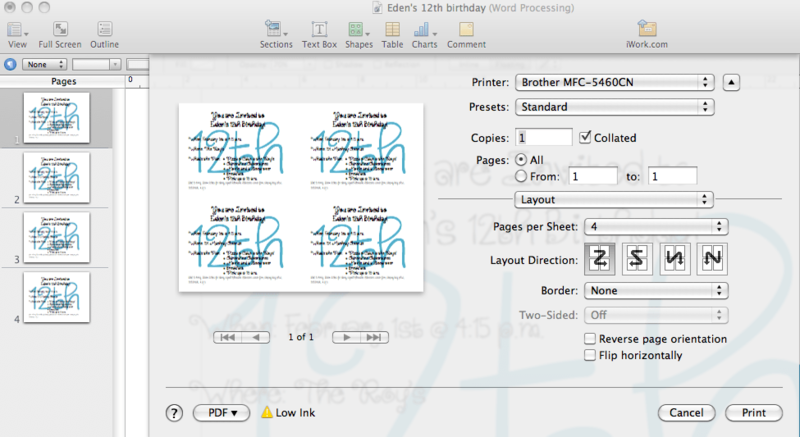 I started by covering the backs of the printed invitations with the paper Eden had chosen. I then gently sanded the edges to reveal some of the white below the dyed surface. I then used a turquoise/teal ink on all of the edges. This is nothing more than dabbing the ink pad along the edges. I used a make-up style brush to get into the grooves that the pad wouldn’t reach. I then cut a strip of coordinating paper (one side with a scalloped edge) and adhered it to the right side of the card with double-sided tape. I also happened to have ribbon on hand that I ran down the straight edge of the paper strip. This became my base card. From here, I began to play with embellishments to see what I could come up with for a finished look. I ended up using a combination of a few items I had on hand. First, I took a handful of these cheap dollar store snowflakes and tried to kick them up a notch. 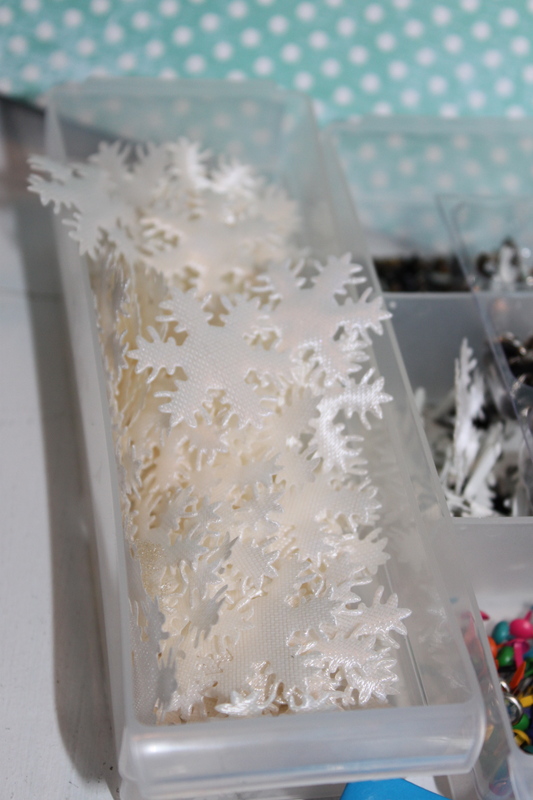 Cheap white snowflakes approximately 1″ in size. On some, I added blue gel pen topped the blue with a clear glitter glue. (Those on the envelopes only have glitter glue.) I also added a little silver dot to the center of the snowflakes I mounted on the card. These are the smallest snowflakes on the invitations, located closest to the bottom of the card. The second snowflake is a made of plain white felt. I found these snowflakes at Target in the same bin as the paper package. The snowflake at the top was made by mounting a snowflake sticker onto teal circles and hand cutting around the outside edge. Left over circles from another project. I simply staggered the snowflakes when I mounted them and used 3D foam mounting dots to add extra dimension when mounting the smallest snowflake at the bottom. Finally, I stamped “Save the Date!” on that adorable polka dot paper and then stuck it on a white “tag” that I had cut out on my Cricut. I added a little line/dot pattern around the outside edge with a black Sharpie and used red ink on edges of the tag. I curled blue wire around the shaft of pen and then twisted it to create a bit of a whimsical look. Finally, I added a bit of embellishment to the envelopes so they would coordinate with the invitation and then added the girl’s names. Here you can see the decorated invitation as well as the printing on the other side. Here are all four, ready to be stuffed and delivered. I am so glad to have the invitations done. We will let them dry over night and then deliver them tomorrow. Hopefully all of the girls can make it!